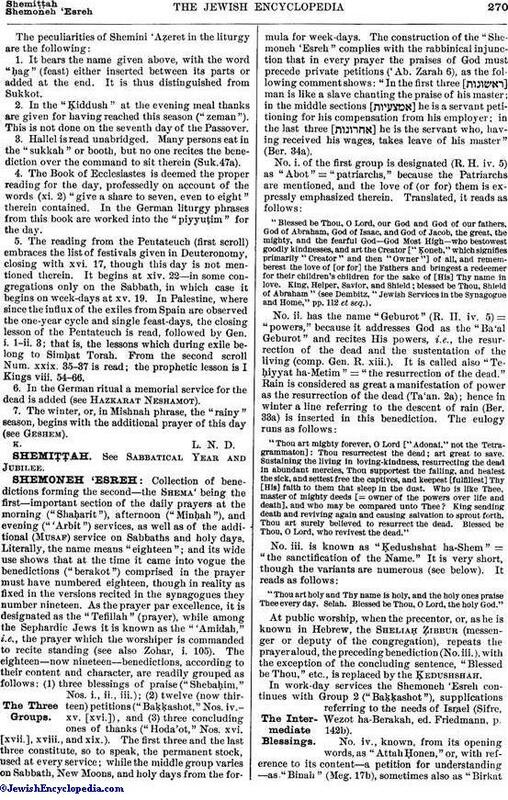 Collection of benedictions forming the second—the Shema' being the first—important section of the daily prayers at the morning ("Shaḥarit"), afternoon ("Minḥah"), and evening ("'Arbit") services, as well as of the additional (Musaf) service on Sabbaths and holy days. 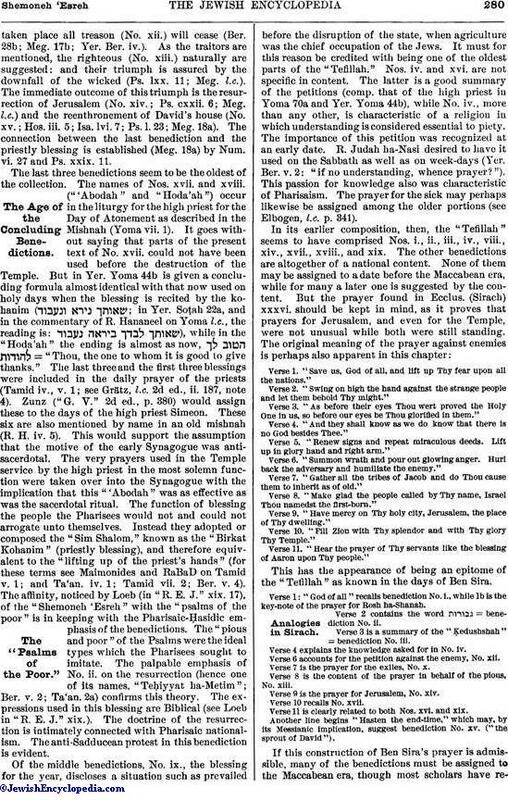 Literally, the name means "eighteen"; and its wide use shows that at the time it came into vogue the benedictions ("berakot") comprised in the prayer must have numbered eighteen, though in reality as fixed in the versions recited in the synagogues they number nineteen. As the prayer par excellence, it is designated as the "Tefillah" (prayer), while among the Sephardic Jews it is known as the "'Amidah," i.e., the prayer which the worshiper is commanded to recite standing (see also Zohar, i. 105). The eighteen—now nineteen—benedictions, according to their content and character, are readily grouped as follows: (1) three blessings of praise ("Shebaḥim," Nos. i., ii., iii. ); (2) twelve (now thirteen) petitions ("Baḳḳashot," Nos. iv.-xv. [xvi. ]), and (3) three concluding ones of thanks ("Hoda'ot," Nos. xvi. [xvii. ], xviii., and xix.). 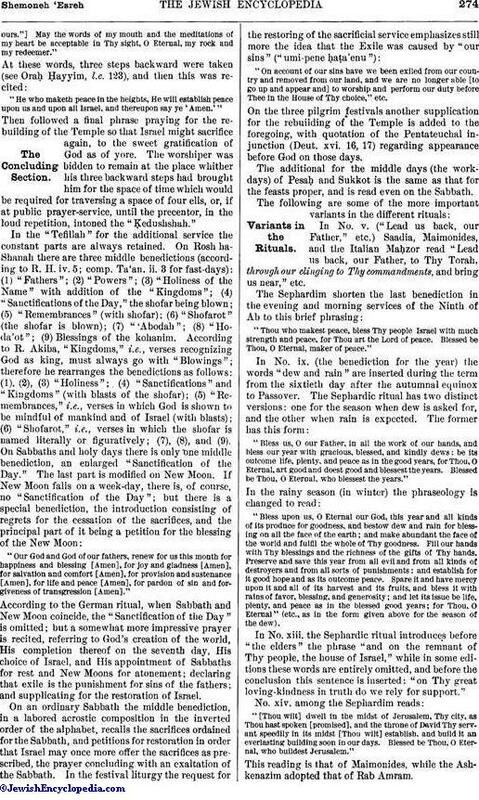 The first three and the last three constitute, so to speak, the permanent stock, used at every service; while the middle group varies on Sabbath, New Moons, and holy days from the formula for week-days. The construction of the "Shemoneh 'Esreh" complies with the rabbinical injunction that in every prayer the praises of God must precede private petitions ('Ab. Zarah 6), as the following comment shows: "In the first three [ ] man is like a slave chanting the praise of his master; in the middle sections [ ] he is a servant petitioning for his compensation from his employer; in the last three [ ] he is the servant who, having received his wages, takes leave of his master" (Ber. 34a). In No. xvi. God is addressed as "Ab ha-Raḥman" = "the Merciful Father." Before the conclusion is inserted "Be gracious unto us and answer us and hear our prayer, for Thou hearest the prayer of every mouth" (the "'Aruk," under , gives this reading: "Full of mercy art Thou. Blessed be Thou who hearest prayer"). In the "Reẓeh" (No. xvii.) the text differs somewhat: "Be pleased . . . with Thy people Israel [as in the German ritual] and to their prayer give heed"—a reading presented by Maimonides also. Furthermore, the word "meherah" (= "speedily") is introduced as qualifying the expected answer to the prayer and the offerings. Amram has this adverb; but MaHaRIL objects to its insertion. The "Kol Bo" states that No. vii. has eighteen words, as has the verse Ex. xvi. 25; and this would justify the insertion of the word "Na" ( ), which appears in some versions. The "Roḳeaḥ," however, reports only seventeen words, as in the German version. No. viii. has twenty-seven words, corresponding to the same number in Ex. xvi. 26 or in the verse concerning circumcision (Gen. xvii. ), or to the twenty-seven letters of Prov. iv. 22 or Ps. ciii. 3. 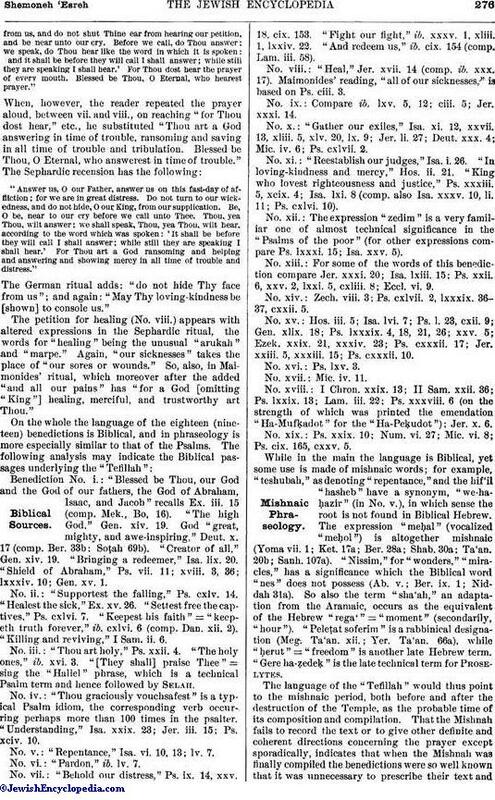 This list of correspondences in the number of words or letters, invoked by the very late authorities to settle disputed readings, might be extended, as such analogy is assigned to almost every benediction (see Baer's commentary in his "Seder 'Abodat Israel." pp. 89 et seq.). The Talmud names Simeon ha-Paḳoli as the editor of the collection in the academy of R. Gamaliel II. at Jabneh. (Ber. 28b). But this can not mean that the benedictions were unknown before that date; for in other passages the "Shemoneh 'Esreh" is traced to the "first wise men" ( ; Sifre, Deut. 343), and again to "120 elders and among these a number of prophets" (Meg. 17b). This latter opinion harmonizes with the usual assumption that the "men of the Great Synagogue" arranged and instituted the prayer services (Ber.33a). In order to remove the discrepancies between the latter and the former assignment of editorship, the Talmud takes refuge in the explanation that the prayers had fallen into disuse, and that Gamaliel reinstituted them (Meg. 18a). (1) While recited in the Temple, the original conclusion of benedictions was "Blessed be Thou, O Eternal, God of Israel from eternity to eternity" (Ber. ix. 5; Geiger, in "Kerem Ḥemed," v. 102; idem, "Lehr- und Lesebuch zur Sprache der Mischnah," ii. 2;"He-Ḥaluẓ," vii. 88), emphasizing the "other eternity or world" denied by heretics. From this is derived the usual designation of God as "King of the world," not found, strange to say, in the eighteen benedictions—a circumstance that attracted the attention of the Rabbis (Ber. 29a). This omission might indicate that the bulk of the benedictions received something like their present form under the supremacy of the Romans, who did not tolerate the declaration "God is king." More likely is the explanation that the omission was for the purpose of avoiding the misconstruction that God ruled only over this world. 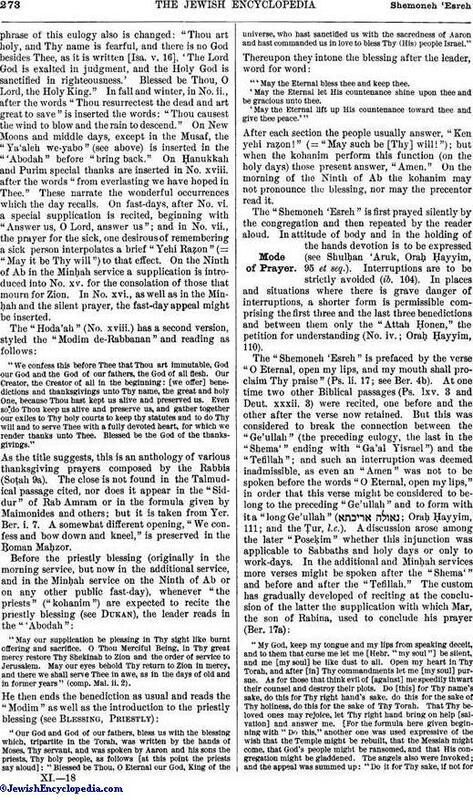 In the Rosh ha-Shanah prayer the thought of God's rulership is all the more strongly emphasized; and this fact suggests that the Rosh ha-Shanah interpolations are posterior to the controversies with the Jewish heretics and the Romans, but not to the time when Christianity's Messianic theology had to be answered by affirmations of the Jewish teaching that God alone is king. The word , wherever found in the text, is a later insertion. So also is the phrase = "in love," which also carries an anti-Pauline point (see Epistle of Paul to the Romans). (2) In the middle, non-constant benedictions (Nos. iv. xvi.) there is a uniform structure; namely, they contain two parallel stichoi and a third preceding the "Blessed be" of the "sealing" (as the Rabbis call it) of the benediction; for example, in No. iv. are: (1) "Thou graciously vouchsafest knowledge to man" = (2) "and teachest mortals understanding"; and (3) "Vouchsafe unto us from Thee knowledge, understanding, and intelligence." By this test the later enlargements are easily separated from the original stock.In the "sealing" formula, too, later amplifications are found. It was always composed of two words and no more, as in Nos. vii., ix., xiv., and xvi. of the present text; so No. vi. originally, read ; No. viii., ; and the others similarly. The last three benedictions seem to be the oldest of the collection. The names of Nos. xvii. and xviii. 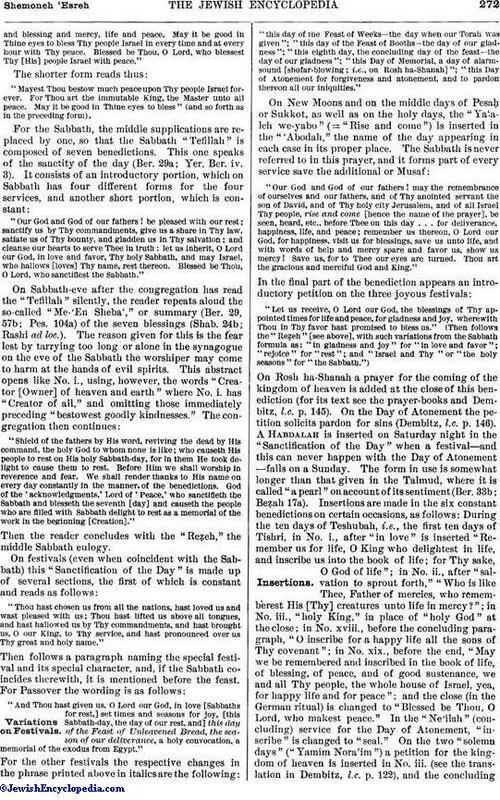 ("'Abodah" and "Hoda'ah") occur in the liturgy for the high priest for the Day of Atonement as described in the Mishnah (Yoma vii. 1). It goes without saying that parts of the present text of No. xvii. could not have been used before the destruction of the Temple. But in Yer. Yoma 44b is given a concluding formula almost identical with that now used on holy days when the blessing is recited by the kohanim ( ; in Yer. 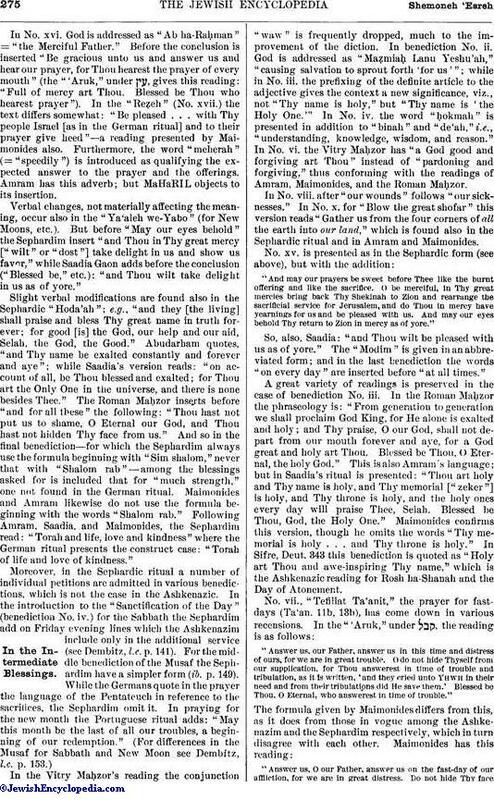 Soṭah 22a, and in the commentary of R. Hananeel on Yoma l.c., the reading is: ), while in the "Hoda'ah" the ending is almost as now, = "Thou, the one to whom it is good to give thanks." The last three and the first three blessings were included in the daily prayer of the priests (Tamid iv., v. 1; see Grätz, l.c. 2d ed., ii. 187, note 4). Zunz ("G. V." 2d ed., p. 380) would assign these to the days of the high priest Simeon. 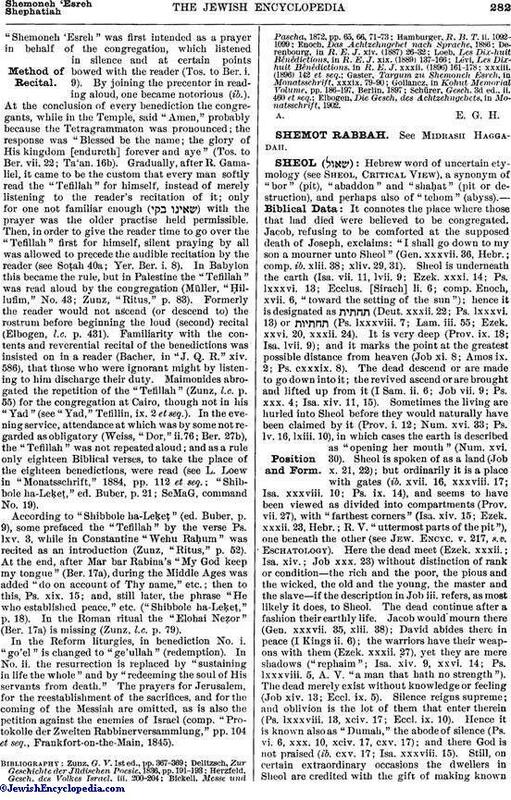 These six are also mentioned by name in an old mishnah (R. H. iv. 5). This would support the assumption that the motive of the early Synagogue was antisacerdotal. The very prayers used in the Temple service by the high priest in the most solemn function were taken over into the Synagogue with the implication that this "'Abodah" was as effective as was the sacerdotal ritual. The function of blessing the people the Pharisees would not and could not arrogate unto themselves. Instead they adopted or composed the "Sim Shalom," known as the "Birkat Kohanim" (priestly blessing), and therefore equivalent to the "lifting up of the priest's hands" (for these terms see Maimonides and RaBaD on Tamid v. 1; and Ta'an. iv. 1; Tamid vii. 2; Ber. v. 4). Verse 2 contains the word = benediction No. ii. If this construction of Ben Sira's prayer is admissible, many of the benedictions must be assigned to the Maccabean era, though most scholars have regardedthem as posterior to the destruction of the Temple. The verse marked 5, indeed, seems to be a commentary on benediction No. xi. It begins with the word , and thus suggests the verse: "Lead us back to Thee and we shall return, renew our days as of yore" (Lam. v. 21, Hebr.). Instead of for the "judges," Ben Sira prays for the reestablishment of God's "judgments," in open allusion to the Exodus (Ex. xii. 12; Num. xxxiii. 4; Ezek. xxv. 11, from which verse he borrows the name "Moab" as a designation of the enemy in the prayer). It is probable that the reading of No. xi. as now given is a later reconstruction of a petition with the implications of the Ecclesiasticus paraphrase. This explanation will obviate the many objections raised against the current opinions; e.g., that under Roman or other foreign rule the Jews would hardly have been permitted to cast reflections on the courts of their masters. The Maccabean period seems to furnish adequate background for the national petitions, though the experiences of the Roman war and the subsequent disasters may have heightened the coloring in many details. The history of the petition against enemies may serve to illustrate the development of the several component parts of the "Tefillah" in keeping with provocations and changed conditions. The verses of Ecclesiasticus make it certain that the Syrian oppressors were the first against whom this outcry of the poor, oppressed victims of tyranny was directed. 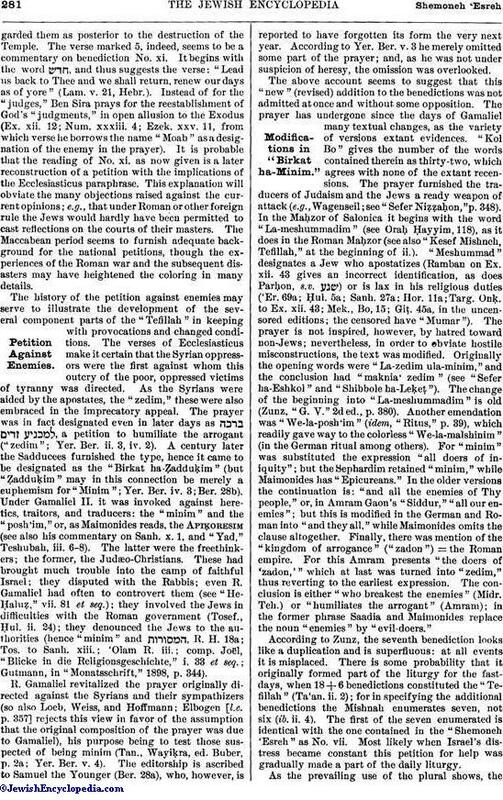 As the Syrians were aided by the apostates, the "zedim," these were also embraced in the imprecatory appeal. The prayer was in fact designated even in later days as , a petition to humiliate the arrogant ("zedim"; Yer. Ber. ii. 3, iv. 2). 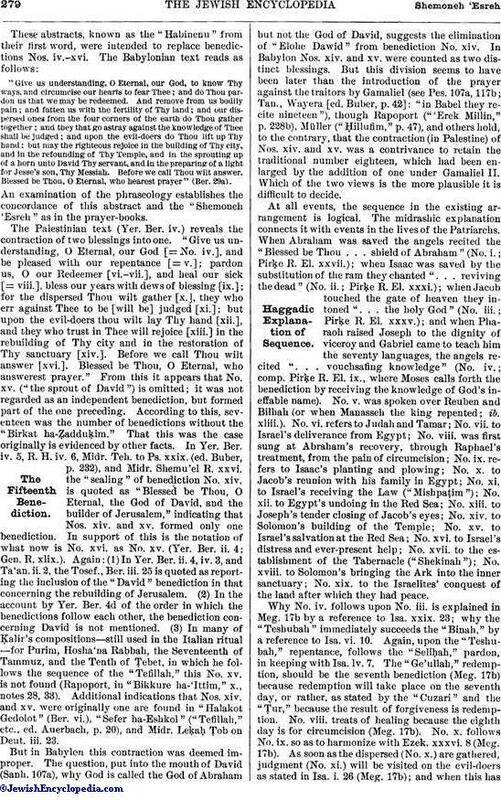 A century later the Sadducees furnished the type, hence it came to be designated as the "Birkat ha-Ẓadduḳim" (but "Ẓadduḳim" may in this connection be merely a euphemism for "Minim"; Yer. Ber. iv. 3; Ber. 28b). Under Gamaliel II. it was invoked against heretics, traitors, and traducers: the "minim" and the "posh'im," or, as Maimonides reads, the Apiḳoresim (see also his commentary on Sanh. x. 1, and "Yad," Teshubah, iii. 6-8). The latter were the freethinkers; the former, the Judæo-Christians. These had brought much trouble into the camp of faithful Israel; they disputed with the Rabbis; even R. Gamaliel had often to controvert them (see "He-Ḥahuẓ," vii. 81 et seq. ); they involved the Jews in difficulties with the Roman government (Tosef., Ḥul. ii. 24); they denounced the Jews to the authorities (hence "minim" and , R. H. 18a; Tos. to Sanh. xiii. ; 'Olam R. iii. ; comp. Joël, "Blicke in die Religionsgeschichte," i. 33 et seq. ; Gutmann, in "Monatsschrift," 1898, p. 344). The above account seems to suggest that this "new" (revised) addition to the benedictions was not admitted at once and without some opposition. The prayer has undergone since the days of Gamaliel many textual changes, as the variety of versions extant evidences. "Kol Bo" gives the number of the words contained therein as thirty-two, which agrees with none of the extant recensions. The prayer furnished the traducers of Judaism and the Jews a ready weapon of attack (e.g., Wagenseil; see "Sefer Niẓẓaḥon,"p. 348). In the Maḥzor of Salonica it begins with the word La-meshummadim" (see Oraḥ Ḥayyim, 118), as it does in the Roman Maḥzor (see also "Kesef Mishneh, Tefillah," at the beginning of ii.). "Meshummad" designates a Jew who apostatizes (Ramban on Ex. xii. 43 gives an incorrect identification, as does Parḥon, s.v. ) or is lax in his religious duties ('Er. 69a; Ḥul. 5a; Sanh. 27a; Hor. 11a; Targ. Onḳ. to Ex. xii. 43; Mek., Bo, 15; Giṭ. 45a, in the uncensored editions; the censored have "Mumar"). The prayer is not inspired, however, by hatred toward non-Jews; nevertheless, in order to obviate hostile misconstructions, the text was modified. Originally the opening words were "La-zedim ula-minim," and the conclusion had "maknia' zedim" (see "Sefer ha-Eshkol" and "Shibbole ha-Leḳeṭ"). The change of the beginning into "La-meshummadim" is old (Zunz, "G. V." 2d ed., p. 380). Another emendation was "We-la-posh'im" (idem, "Ritus," p. 89), which readily gave way to the colorless "We-la-malshinim" (in the German ritual among others). For "minim" was substituted the expression "all doers of iniquity"; but the Sephardim retained "minim," while Maimonides has "Epicureans." In the older versions the continuation is: "and all the enemies of Thy people," or, in Amram Gaon's "Siddur," "all our enemies"; but this is modified in the German and Roman into "and they all," while Maimonides omits the clause altogether. Finally, there was mention of the "kingdom of arrogance" ("zadon") = the Roman empire. For this Amram presents "the doers of 'zadon,"' which at last was turned into "zedim," thus reverting to the earliest expression. The conclusion is either "who breakest the enemies" (Midr. Teh.) or "humiliates the arrogant" (Amram); in the former phrase Saadia and Maimonides replace the noun "enemies" by "evil-doers." As the prevailing use of the plural shows, the"Shemoneh 'Esreh" was first intended as a prayer in behalf of the congregation, which listened in silence and at certain points bowed with the reader (Tos. to Ber. i. 9). By joining the precentor in reading aloud, one became notorious (ib.). At the conclusion of every benediction the congregants, while in the Temple, said "Amen," probably because the Tetragrammaton was pronounced; the response was "Blessed be the name; the glory of His kingdom [endureth] forever and aye" (Tos. to Ber. vii. 22; Ta'an. 16b). Gradually, after R. Gamaliel, it came to be the custom that every man softly read the "Tefillah" for himself, instead of merely listening to the reader's recitation of it; only for one not familiar enough ( ) with the prayer was the older practise held permissible. 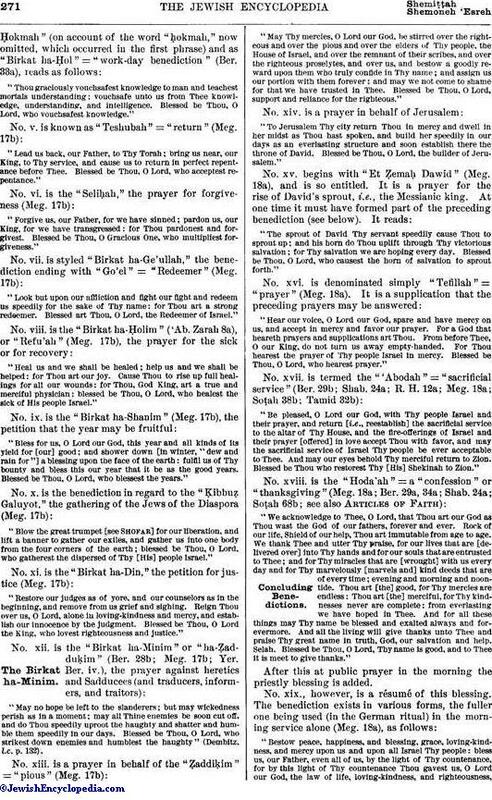 Then, in order to give the reader time to go over the "Tefillah" first for himself, silent praying by all was allowed to precede the audible recitation by the reader (see Soṭah 40a; Yer. Ber. i. 8). In Babylon this became the rule, but in Palestine the "Tefillah" was read aloud by the congregation (Müller, "Ḥillufim," No. 43; Zunz, "Ritus," p. 83). Formerly the reader would not ascend (or descend to) the rostrum before beginning the loud (second) recital (Elbogen, l.c. p. 431). Familiarity with the contents and reverential recital of the benedictions was insisted on in a reader (Bacher, in "J. Q. R." xiv. 586), that those who were ignorant might by listening to him discharge their duty. 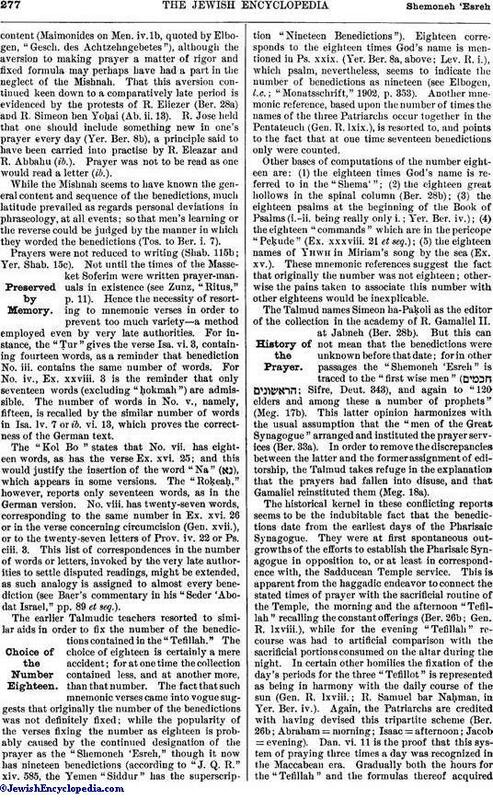 Maimonides abrogated the repetition of the "Tefillah" (Zunz, l.c. p. 55) for the congregation at Cairo, though not in his "Yad"(see "Yad," Tefillin, ix. 2 et seq.). In the evening service, attendance at which was by some not regarded as obligatory (Weiss, "Dor," ii. 76; Ber. 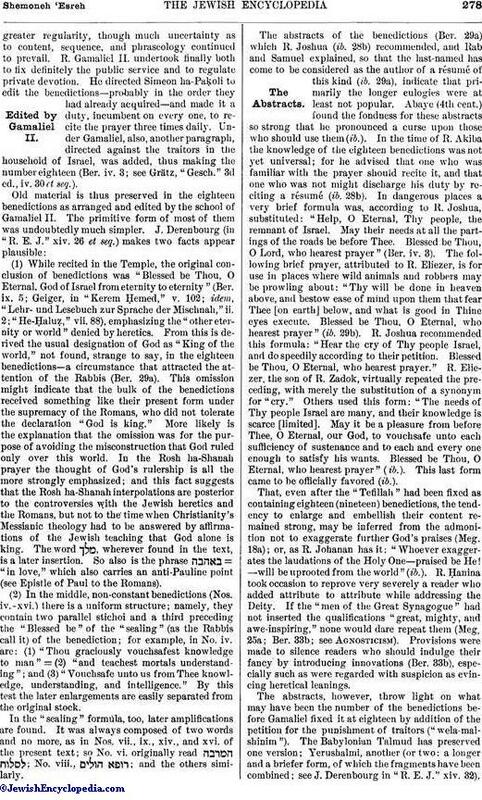 27b), the "Tefillah" was not repeated aloud; and as a rule only eighteen Biblical verses, to take the place of the eighteen benedictions, were read (see L. Loew in "Monatsschrift," 1884, pp. 112 et seq. ; "Shibbole ha-Leḳeṭ," ed. Buber, p. 21; SeMaG, command No. 19).